In the Lower Peninsula of the state of Michigan, a widespread drought had begun to dry out pastures, crops, wells and, eventually, forests. The area was rich in timber, and a great deal of it had been cleared for the homesteads of new settlers to the region. By mid-September, the small land-clearing fires of the settlers combined with high winds and dried-up refuse left by the local timber industry to form a wildfire that burned through more than a million acres in 24 hours. 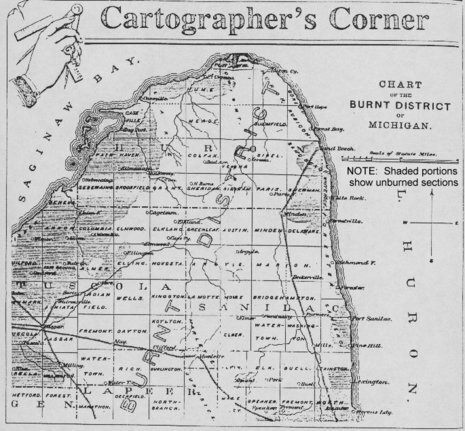 What became known as the Michigan "Thumb Fire" (named after the shape of the Lower Peninsula) killed nearly 300 people (sources vary on this number) and caused $2.5 million in damages. The fire left thousands of rural survivors homeless and without crops, livestock or jobs. While not as extensive as the 1871 fire, the fire of September 1881, commonly known as the Thumb fire, was more severe and did more damage since settlers had begun pouring into the region and logging had gotten underway. As a result, more people were rendered homeless and the loss was greater. It is estimated that this fire burned well over one million acres, cost 282 lives, and did more than $2,250,000 worth of damage. Like the 1871 fire, the fire of 1881 came at the end of an extremely severe drought and was the result of hundreds of land-clearing fires whipped into a seething cauldron of flame by high winds. It was worse in the Saginaw Valley and Thumb region where it burned over much of the same territory that had burned ten years before. The overwhelming heat and power of the fire were astonishing. A survivor in Bad Axe, Roderick Park, recalled, "The onrushing flames would leap high in the air, then descend to the ground like a bouncing ball, burn everything before them, then rise for another leap. Under the arch made by the leaping flames, the area was unscathed, thus many buildings in the path of the fire were not burned. Where the fire struck there was utter destruction. Farming implements had every particle of wood burned off. Handles were burned from the ploughs left in the furrows. All that was found of wooden harrows was the iron teeth.